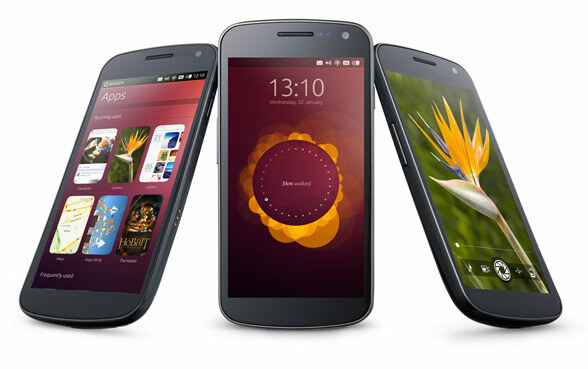 We all know Ubuntu as a popular operating system for desktop and now Canonical has just announced the Ubuntu OS for smartphones. Our first impressions with the new OS are the clean UI and fast multitasking. Basically, the Ubuntu Phone OS is built on Android kernel and drivers, and it does not use Java Virtual Machine. It is promised to take the most advantage of hardware and it will be compatible with both ARM and x86 processors. We can notice that the Ubuntu interface is quite similar to the MeeGo OS on Nokia N9 or BlackBerry 10 on the Dev Alpha. Navigation on the UI depends a lot on swiping gestures from all edges of the screen. For example, we can swipe slightly from left edge to bring up a dock of favorite apps, a full swipe from left to right edge will show the screen of open apps. The multitasking is also implemented easier for users, each swipe from the right edge will turn you back to the previous app. Ubuntu OS also has notification bar like Android or iOS but it seems better. We can view messages, missed calls like other OSs but when we swipe from the icons on notification bar, we can go to according settings immediately without leaving the current app. We can also access app controls easily by swiping up from the bottom, this part is hidden and revealed instantly and doesn’t take any room of our screen, so we can focus on the content of the app. The greatest feature of Ubuntu Phone OS is that its core apps run at full native speeds with less memory footprint. Therefore, the OS provides fast experience even on low hardware. The entry level Ubuntu smartphone requires just 1Ghz Cortex A9 processor, 512MB – 1GB of RAM, 4-8GB eMMC + SD storage and multi-touch screen. Besides, the Ubuntu for Android project will also continue to be maintained although it hasn’t gained much attention since announcement last year. Ubuntu for Android can turn your Android handset into a modified Ubuntu PC when connected to a PC through a dock. I am a little disappointed with the OS as it is still in development and they announced that the first devices will ship in early 2014, so we have one more year to wait. At the moment, the first and only smartphone running Ubuntu phone OS is the Samsung Galaxy Nexus. It is said that the Galaxy Nexus build will be available for download in about 4 weeks. If you want to get early hands-on the Ubuntu Phone OS, you will need the Galaxy Nexus. Although Ubuntu Phone OS is coming quite late, it still has some potentials to catch up with Android and iOS. We will wait ’til CES 2013 for more details. Let us know your impressions of the new OS.